Just days after Bumble the Abominable Snowman scores a date with a cute little red-head, and one week before Christmas, Santa is gearing up for a pool party with the crew before the big night of delivering toys. As the boss elf is reporting things are ahead of schedule, Santa consults his Windows Phone where the “Naughty or Nice Live App” reports that thousands of children have earned a spot on the “nice” list. The party is canceled and Santa being the good manager he is reports to the elves that more toys are needed. The elves get the update on their Windows Phones and rejoice in having more work heaped on them. 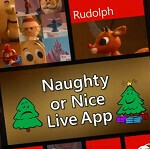 Unfortunately, we could not find any Naughty or Nice app in the Windows Phone Store, but we are certain that you are all on the nice list. Santa got me a Note 2 already. Guess he used the S-Pen to write his naughty and nice list. Cause it sounds like your an ungrateful child. i want naughty lumia and a nice 920,..santa! Wow, phone arena and its fanboy comentators over-analyzing an advertisement aimed at children. Did somebody forget to take their Zanax today?